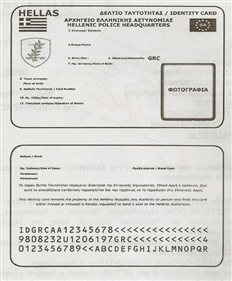 Everyone with Greek citizenship is entitled to a Greek national ID or police identity card (δελτίου αστυνομικής ταυτότητας/(deltiou astynomikis tautotitas), although only those permanently living in Greece really need one. Used in all public and private transactions, it is required to get an AFM (tax number), AMKA, secure a bank account or credit card, apply for a Greek driver’s license, sign a contract (lease, work, prepaid phone or subscription, utility bills, purchase a home), take part in examinations, enroll in school or a university, see a state doctor, register for state insurance, collect unemployment, get married, receive pension payments and so much more. Greeks living abroad can also use their Greek ID to renew a Greek passport without sending for certificates to verify his/her registration in Greece. Unlike other countries, the possession of a Greek national ID (tautotita) does not hold a higher or more exclusive status, since all of the same transactions mentioned above can be performed with a passport from any country. All residents and visitors to Greece should carry some form of identification at all times. Failure to produce proof at the request of law enforcement officials could result in temporary detention, while your identity is established and verified. *Article last updated January 3, 2015. However, ‘Comments’ reflect a specific case and/or whatever laws were in effect at that time. Greek ID photo is from my personal collection and may not be reused. It has also been Photoshopped, removing vital elements to help prevent forgery. Greek ID cards (tautotites) used to be handwritten and only in Greek. Since 2000, they were changed to Greek and Latin characters to facilitate travel within EU/Schengen zone without a passport. In June 2005, two further changes were made. The process of issuing a Greek ID was simplified, thus cutting the wait time from one year to a few minutes, and the mandatory age to get a Greek ID (tautotita) was changed from 14 years to 12 years*. Although the Greek ID is now bilingual and printed, it no longer has a fingerprint, lists no religious affiliation or spouse name, and does not contain a microchip that would facilitate passage through automated customs control now available at some international airports. The latter is one reason a new Citizen Card is under consideration, though a biometric passport achieves the same thing. It is technically not a “European” or EU ID; it is a Greek ID concerned with designating a person by nationality and country, not by continent. All European countries have their own unique ID for their respective citizens. It also does not meet the lawful Schengen standard, which is why many EU/Schengen members refuse to accept it as a valid form of identification and will ask for a Greek passport. Schengen countries, which include Greece, are required to issue IDs valid for a maximum of 10 years. However, most people keep the same Greek ID until they die and a June 2009 law only states that they must be replaced every 15 years. The majority of Greek citizens feel no need to update or exchange their IDs, which causes problems for passport control, airlines and other border authorities because grown adults will have ID photos of themselves as teenagers. However, as of 2011, enforcement of the 2009 law is being stepped up. Many police stations in Greece require that Greek citizens have a Greek national ID with Latin letters before accepting first-time and renewal applications for Greek passports. *Many official websites and other online sources say that the mandatory age to get a Greek ID is 14 years. This is incorrect, which they should know if doing proper research and updates. In September 2010, the interior ministry announced that the new Greek ‘Citizen Card,’ Κάρτα του Πολίτη or καρτότητα/kartotita would replace the Greek national ID by the end of 2011. However, Greece had no elected government from November 2011 and a coalition took power in June 2012. A digital-friendly, credit card-sized ID with microchip will make it possible to complete secure transactions pertaining to pensions, prescriptions, taxes and other bureaucracy, saving both time and money. France, Germany (since 1967), Belgium, Italy and Spain have already phased in electronic cards or e-cards. The Ministry of Interior opened the draft bill to public consultation in November 2010. Since then there have been no real action or details on the application process, only more debates in November 2012 on how and why it should be implemented. *An article with photos will be published and linked here when known. On June 14, 2012, the Ministry of Citizen Protection announced it would begin phasing in credit-card sized national or police identity cards (pictured above), which harmonize with directive 2252/2004 and will be recognized as travel documents valid within the EU. Issuance was scheduled for Fall 2012, but thus far nothing has been made mandatory and no one is being forced to swap. All Greek citizens will be required to replace their current blue national/police ID card (pictured at the top of article) in chronological and alphabetical order. Meaning, the oldest cards in circulation would be swapped first by year and surname. * The process to apply will be the same. Current ID cards will continue to be valid until replacement. *I will update when/if it it changes. Greek ID cards are only issued in person by local police stations in Greece on behalf of the Ministry of Citizen Protection. According to the official website*, Identity Offices or Γραφεία Ταυτοτήτων/Grafeia Taftotiton are open daily from 7:30-14:30, except Wednesday when they operate 14:00-20:30. On Saturdays, hours are 8:00-13:00 during which only students can apply. *In reality, many police stations do not follow the schedule set forth by the Ministry of Citizen Protection. It was agreed in September 2011 that a special unit would be set up at consulates in Germany to issue Greek ID cards to the diaspora; and in December another was announced for Cyprus. The official press release did not specify which locations in Germany would handle applications, only that 18 police officers would be dispatched and rotated out every three (3) months. No other Greek consulates/embassies are currently authorized to accept applications for or issue Greek national IDs/tautotites. *I am looking for someone who had a Greek police identity card issued in Germany or Cyprus and can share their first-hand experience in Comments. Everyone applying for a Greek ID for the first time must go in person and bring a witness*, not just minors who need to be accompanied by a parent/guardian. There are no online applications. 1. Go to the police station or consulate (in Germany and Cyprus only) to issue a Greek national ID. Some require appointments; others do not. If police need to request your Greek citizenship records, it may take a few days and you will be asked to come back. 2. Police may ask you to fill out and sign a dilosi (statement of facts) stating your intention to secure a new ID and/or the presence of a witness. *Special thanks to readers who alerted me of the change several months before the official website amended their article in Greek. 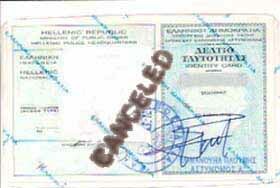 — Police will automatically request it from your οικογενειακή μερίδα/oikogeniaki merida via fax or electronically. If they cannot find it or police at that location do not provide this service, only then will you be asked to secure an original and it must specifically state that it will be used for the issuance of your Greek ID. c) a signed declaration/dilosi that you are from abroad, even though the law as written does not state this. All Greek citizens from abroad report different variations at different times in different locations. This is Greece, everyone’s experience can vary, so please do not ask me which they will ask you for. — Must show your entire face with an expression that is neither smiling or frowning; hair must be pulled away from the face, face must be matte and mouth closed. *Some were asked for three (3) photos, others were asked for four (4). I always carry extras because it’s better to have too many than too few. **Greek Police website now says 36 mm x 36 mm, but their update was posted nearly a year after my readers checked in. — If you live outside Greece, utility bill of a relative or you may be asked to sign a dilosi that you live abroad (monimos). — Dual Greek citizens who have a name different than the transliterated Latin name should provide a photocopy of a non-Greek passport or birth certificate or other official document, and the original to show Greek authorities. — It has been 15 years since your current one was issued. — It has been lost or stolen. Some police stations issue Greek national IDs on the spot if you bring everything with you. Some require appointments. If the location you visit requires you set an appointment, you will complete the two steps below, then come back on a different day to turn in required documents. d) You are a minor and must be accompanied by a parent/guardian. — If your ID was stolen, you must present evidence of this fact (e.g., a police report) and give a statement under which it occurred. — If it concerns a name change, bring documentation of this fact (e.g., court document, marriage certificate). 2. Hand over your current Greek ID to police. — If you are required to set an appointment and come back another day, make sure you won’t need it for any transactions or have other means of ID (passport, driver’s license). — Must be issued within 90 days of application. 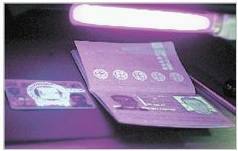 — A reader who acquired a Greek ID in June 2010 says the photo’s measurements are 35 mm x 35 mm. — It is not a passport photo. Police stamp, verify and enter the information into a computer, three copies of an application form are printed out and the new ID is created while you wait or you will be asked to come back the next day to pick it up (depends on location)*. Sign the papers and ID card, which is then laminated and given to you. If reissuing an updated or new ID to replace a former one, a completely new ID number will be assigned — you do not keep the same number. However, the old and new numbers are cross-referenced to identify you as the owner of both. The old card is held on file. *Ask if they issue the same day or next day before submitting your papers, if time is an issue for you. How long does it take to get a Greek national ID or tautotita? 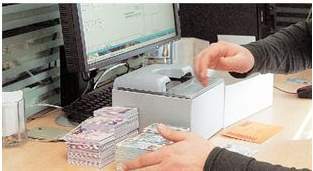 Many police stations can issue a Greek ID on the spot without an appointment, as issuance only takes a few minutes if the right documents are found or provided. However, some locations demand that you make an appointment and come back the next day or in a few days. It depends on the police station and how long it takes to receive Greek citizenship records, if you do not provide them yourself. What information does it list? It does not list address or phone number, nor does the current version list the mother’s name in English. Names in English/Latin letters on police identities or national ID cards are typically transliterated from Greek, following a formula set by ELOT 743 that harmonizes with the International Standard (ISO 843). To see your Greek name transliterated to Latin, click “ELOT 743 Translator,” use the left column and enter your name in Greek. a) have Greek letters that do not literally transliterate to English, i.e., ψ, δ, γ, χ, ξ.
b) have a Latin name with letters that do not literally translate to Greek, i.e., B, D, G, J, W, Υ.
c) started with a Latin name that was translated to Greek, then transliterated back to Latin. ΠΑΝΑΓΙΩΤΗΣ, followed by PANAGIOTIS OR PETER (taken from a private email). The old Greek ID has no expiration date, but the Ministry of Citizen Protection says it must be replaced every 15 years. Therefore, you should count 15 years from the date it was issued and enter this on the airline form. If your Greek ID hasn’t been replaced in the last 15 years, you are legally obliged to apply for a new one per a 2009 law that says all citizens should swap. Can I still travel within the EU/Schengen using my old Greek ID? Everyone with an updated Greek national ID in Greek/English is permitted to travel within the EU and Schengen zone as of April 2010; plus FYROM, as of August 7, 2007. Those who have the older ID (in Greek only) can still use it as a valid form of identification but must swap for a new ID. Why? Because Schengen requires Latin letters and Greek laws in place since June 2009 say that Greek IDs must be replaced every 15 years, so everyone should have done it by now. Otherwise, Greek citizens should be in possession of a biometric Greek passport to travel. Note that the phrase “Without prejudice to” means the directive is not binding and leaves room for any member state to allow its own laws to override those of the EU. Therefore, an EU member state can refuse to recognize a national ID as a valid document and request a passport. The Greek national ID or police identity card also does not follow the Schengen rule of being valid for a maximum of 10 years, which means Schengen member states can refuse to acknowledge it as a legal document for the purpose of identification or travel within its territory. Official ministry websites in several EU member states acknowledge these gray areas, saying that EU citizens should have a national ID card or a biometric passport “as appropriate,” giving airlines, ferry companies and border authorities the right to ask for either. *Note that some travelers report that they were able to use their Greek ID to travel between all EU member states, even if it was an old Greek ID without Latin letters. However, some were asked for a biometric passport instead. Can I use my Greek ID to travel to/from the UK? The UK Border Agency says that EU citizens must show a national ID card or a passport. However, note in ‘Comments’ that Sandra was told that her British-Greek children require passports to travel, not just a Greek national ID card. Tracey shares her experience in being told by UK border/passport authorities that a Greek ID is not valid for travel, though two of her children were allowed passage at other airports in the UK. And UK border authorities wanted Elizabeth to show a Greek passport, not a Greek ID, when traveling from Paris on Eurostar. Based on Article 5 and EU directive mentioned in the previous section, UK authorities and airlines are within their right to ask for a biometric Greek passport issued after August 26, 2006. For example, in “Ταξιδεύω στο Ηνωμένο Βασίλειο” (I’m traveling to the UK), Olympic Air says that passengers traveling to/from the UK are required to present the following information at check-in: Name, Gender, Date of Birth, Nationality, Passport Number, Passport Expiration Date and Country Issuing Passport. Half of these elements cannot be provided by a Greek ID alone. Readers are free to inquire at the nearest UK consulate/embassy to receive advice. However, this is not a foolproof method since different locations and staff members dispense conflicting information. *Hat tip to readers and commentators for providing first-hand experience, and trusted confidante CEO for sending me links & his private consultation on the above sections. My June 2007 article is based on documentation received at the police station before official government websites existed in any language, combined with the first-hand experiences of Greek citizens in my life, then updated over the years with the news articles and press releases listed below and readers’ experiences shared in comments. After my article was published, the Ministry of Public Order website offered a poorly translated English version, which was followed by an inaccurate page by the Ministry of Citizen Protection and a third version by the Greek police website in late 2010 that does not match the requirements stated in the Greek version. Official websites, in general, are unreliable, inaccurate and rarely updated. A Wikipedia entry also appeared years after my article and contains incorrect information. The above article is based on people’s real-life experience. None of them mention being refused an ID for being a draft dodger, nor do the requirements include producing any papers related to that status though police do access the oikogeneiaki merida and can easily check. Draft dodgers are tolerated, and many hyphenated Greeks living outside Greece continue to get Greek passports and Greek IDs as long as they have a permanent resident abroad certificate or go to the military recruiting office to declare their status. The worst that can happen is he’s refused an ID and will be told why on the spot. They will not and cannot arrest or conscript him in the station. The military will be notified, and the police will deliver and have him sign a paper that says he must appear within 3 days to give answers about his status. He can choose to not appear and leave the country, then resolve things at the Greek embassy/consulate nearest his current residence. Also, it is not contradictory information you’re getting. Greece is a ‘results may vary’ country where rules are often flexible, so everyone’s experience can vary. First off a huge thank you! You have greatly reduced my headaches. My husband and I just made the move to Athens. After 2 months of working on it, I finally got my Greek ID just yesterday. I just wanted to let you know my experience at the police station. I needed my oikogeneiaki merida ID paper, my witness and 4 photos (one of which they gave back to me-go figure). I didn’t need to bring a stamp. The police station provided a stamp for .23 euro. I also had to write on the application that I am from abroad and that’s why I didn’t have a previous ID. Thank you again. I still have lots of bureaucracy to deal with, and am sooo glad to have this resource available. Next: husband’s Diamoni Card and my Greek passport. Your experience is identical to the info I already provide above in the article, which says: a) Witness; b) oikogeneiaki merida paper; c) photos; d) if you are from abroad, one or all of the papers listed may be requested. In your case, it was a dilosi (1c); others were asked for 1a, 1b or all three. It does not say you need to bring a stamp. It says that you pay a stamp tax of 0.30 euros. Just a friendly warning. If your husband is American, you only have until the 90th day since his arrival in Greece/Schengen to finish applying for his adeia diamonis. For example, the deadline is August 28 if you arrived on May 29. All best, and thank you for sharing your experience. It helps me monitor changes that official sites don’t disclose. Please Verify, Last time I spent over 5 mths in Greece I applied and was granted an additional 180 Day permit at cost €464. I am considered a dual national Australian Greek. I intend on staying in Greece beyond my visa free period of 90 Days this year but have this time applied for a Hellenic National Identity Card so as to not have to pay the €464.00 fee. I arrived in Greece on an Australian Passport. Its such a pain having to pay so much money to stay for 4 more weeks. Is this OK or will I have to pay again? If you’re a dual national, meaning you’re a Greek citizen, you have the right to stay in Greece as long as you like without applying for a visa extension (not permit) and without paying a fee. The only threat is being drafted into the military if between the ages of 19-45. Because you were previously granted a visa extension and paid a fee, it means you’re not a Greek citizen, or authorities (for whatever reason) did not know you were a Greek national. But if you’re not a Greek citizen, it means you’re ineligible for a Greek national ID. Therefore, something about the information you provided is incomplete or inaccurate, and I cannot verify anything. I have a layover in Athens on a Sunday for 6 hours and my plan was to go and have an ID card issued. After speaking to the Piraeus station they advised they only do this during weekdays. Furthermore I was told that I need to go to the municipality where I am registered (in this case near Thessaloniki). I have my Pistopoihtiko Gennhsis in hand, so they do not need to ask the regional office for this. I know this is Greece and anything goes, but has anyone had an ID card issued recently on a Sunday? As I told commentator ‘Paul’ above, all Greeks I know had their IDs issued at the police station nearest their work or current residence, not where their political rights are registered; I know of no foreign-born Greeks not living in Greece who were turned away from a station of their choice. The official website says nearest one’s residence, and some public sector’s offices can be convinced to help you if you show a utility bill in your name. If you plan on going to the Piraeus station and they will only issue IDs on weekdays and if you’re registered in that municipality, then unfortunately you abide by those rules. All stations — perhaps even down to the individual officer — interpret/implement the law and set their own rules. In my 13 years living in Greece, I never try to do any business on Sunday since this is still considered a day of rest. Only tourist services operate on Sunday. I understand who you are and what you’re trying to do, so I’ve no idea why you felt necessary to repeat the information. I referenced ‘Paul’ as an example because he also is a foreign-born Greek who asked if it was necessary to go to the police station in his registered municipality. ‘Foto’ is foreign born, as is ‘Chris’ who was helped by police stations both in Athens and in his father’s village. All I did was quote the law and give you knowledge based on many people’s experience. first off thank you very much for this valuable and current source of information. Using your advice and with some help from friends within Greece, I got my Greek ID card over the weekend on a brief visit from the UK. I would like to add that the latin characterization of ones name is not a translation. So in my case, Ioannis (in greek text) does not become ‘John’. The issuing office has some lee-way when it comes to letters or letter combinations that make the sound ‘ee’. But that’s as far as they will go. I have a question specifically with the card itself. Does it somehow react to specific lights such as UV? Upon my return to the UK, going through border control I watched others go through using their dog-eared tautotites so I thought I would give it a go also. Unfortunately, I was told that my card was not performing as expected and that I should get it renewed. They would not tell me what they expected to see. Obviously I am not going to get another tautotita anytime soon and next time instead of using my Greek passport for entry (as i did upon the border guards request), I will be insisting that the tautotita is accepted. In the section “What does it list?” I say that the English version is a transliteration based on a formula set by ELOT 743. Greek passports are done to show both the transliteration and translation as you know, but I haven’t seen anything change with the taftotites. The much-rumored, and never implemented, new Greek citizen card (kartotita) may change that in the future, but the non-elected government has other priorities at the moment. The current ID card has security and biometrics embedded, but I haven’t seen one of the newer cards in person to determine whether it reacts to UV light. Border authorities are within their lawful right to ask for either a Greek ID or passport, so you cannot necessarily insist on anything. Also know that Greeks with dog-eared cards will be forced to exchange them the next time they renew their passports. Hi I am living in UK and i want to go back to Greece in February but the problem is that my passport expires 20th january and i tried to book an appointment with the embassy in london but “Zhse Mah Mou Na Fas Trifili”!!! I ve got my old Greek ID with me and i am wondering if could replace it with the new Latin ID through the Greek embassy in london? Your question is already answered above in the section, “Where to apply,” specifically under Outside Greece. Greek passports can be renewed up to a year in advance, and many Greeks in the UK come to Greece to do both the passport and ID if they waited ’til the last minute. Hi, I was reading with interest all this information you provide which is fabulous~! I just wanted to add to the lost taftotita info. My 15-year old daughter lost hers somewhere and so we went to the police station. They were wonderfully helpful and we ended up getting a new one – with no hassle. But, we were told to go to the tax office (not sure what it is called in Greek) and at one of the offices there to declare the first one lost and the 2nd one validated as the current one. Not sure if that makes sense – but it is one step that is not mentioned above. I appreciate you sharing your experience. However, I will not change my article because going to the tax office (eforia) is not a step in issuing a new taftotita after reporting the previous lost. It’s simply protocol for updating one’s personal information on file, just as a person would report a change of address or new passport number to a public sector office or bank. can i travel from the United Kingdom to Germany with a greek national ID Card? You should be able to travel between the UK and Germany with a Greek national ID, but a few people mentioned that they had trouble using their Greek ID cards when reentering the UK, and Germany will usually comment if you’re still carrying the type that’s only in Greek, since Greek citizens should have converted to the bilingual version back in 2009. All EU member states have the right to request a national ID or a passport. I am Greek-American Living in the UK. I was recently coming back from Paris with the Eurostar and the english border woman told me that I have to get a passport but i have never had problems travelling with my i.d. in and out of england. I have done that 3 times coming in england from heathrow and from eurostar with the exact same i.d. My i.d. is from 2009 and the plastic wrapping has fallen apart from one side but it was in that condition when I travelled the other times. Now i am going to be travelling to greece in april and i could renew my i.d. then but do you think i really need the passport. As it is quite expensive to do. Getting a Greek passport is a personal choice on which I cannot advise. However, you can see the instructions detailed at “Greek passport” if interested. Thank you for taking the time to share your experience, and all best. My husband is an Albanian national of Greek heritage. He has lived in Greece since he was 14 and only went back once to renew his passport (which is the non-biometric version). He has a Greek national identity card and lives in the U.S. with a valid Green Card. We want to go and visit his family in Greece this summer but it was recently announced that Albanian passports that are not biometric are no longer valid for international travel. He does not have a Greek passport, but does have the national ID card. Can he travel to Greece with just his Greek ID card or will they turn him away at the border??? A Greek ID card is only valid for travel within the Schengen zone or European Union, as explained in the article above. The USA and Albania are not in the Schengen zone or the EU. Therefore, he needs a passport and border authorities have the right to turn him away. He can get a Greek passport according to instructions at, “Greek passport” or he can renew/reissue his Albanian passport at the Albanian embassy/consulate nearest your residence. hi i m greek but i live in n.ireland. i’m traveling with easyjet from belfast to gatwick and gatwick to corfu. i have identity card. can i travel with that card or i need and the passport? if i can travel with the greek card easyjet ask me for details name surname and the expire date. yes but the greek card doesnt has expire date? please can u help me? thank you and sorry for my greek. You did not provide enough information for me to give a custom answer. In the article under “Can I still travel within the EU/Schengen using my old Greek ID?” and “Can I travel to/from the UK with my Greek ID?” I explain that all Greek citizens are obligated to get the new Greek taftotita in Greek/English as of 2009. If you have this ID, you can travel with that. If you do not, you technically need a Greek passport. You can view instructions at “Greek passport.” You can try to travel with the the old Greek-only Greek ID, but authorities may refuse to recognize it as valid and ask for a passport. In the section called “Expiration Date,” it says that a Greek ID must be replaced every 15 years, so it expires 15 years from the date it was issued. Don’t apologize for anything. We understand each other; that’s all that matters. Hi, I’m living in Greece and planning to go back to the UK in a few months for a month with my family, Greek husband and three small children, I know I need Greek passports for the children which I will be attending appointment tomorrow to fix, I have my UK passport, but my husband has only his Greek ID, which he got the new version a few days ago, In a nut shell would you risk it to go to the UK with the new ID or would you advise to get a passport, as I’m hearing from this end you can go with your ID, but then I’m hearing you might get problems back in the UK, I need to be certain. As I say above, there’s no way to be 100 percent certain. Some of my readers say their Greek ID/tautotita was fine. Others say it wasn’t, and they were asked for a Greek passport. Hi, I’m greek citizen with a valid identity card (greek and latin typed characters) and I’m interested in visiting UK this summer. I read your previous comments about the “gray areas” of doing so. Do you know of any cases of people being DEFINETELY definitely refused entrance ? Do you know of any relevant laws in the UK ? I am not a Greek citizen and use my passport for everything. I am not a UK citizen and have never lived in the UK, and therefore do not know their laws. Everything I know has been detailed above and consistently updated since 2007 with official sources and readers’ contributions.